Blimey, it’s been a while since I’ve done one of these! The past 4 months i’ve been talking about little else than the English walnut kitchen that we have just completed near Bath. That’s partly because it was a truly amazing job and partly because we have done or seen little else! January is never a month to set the world alight and generally it’s a time of year when we make speculative projects, tidy the place up and sort out loose ends. I’m also designing projects and trying to muster up new work. Lots of what we do now has a bearing on the rest of the year. 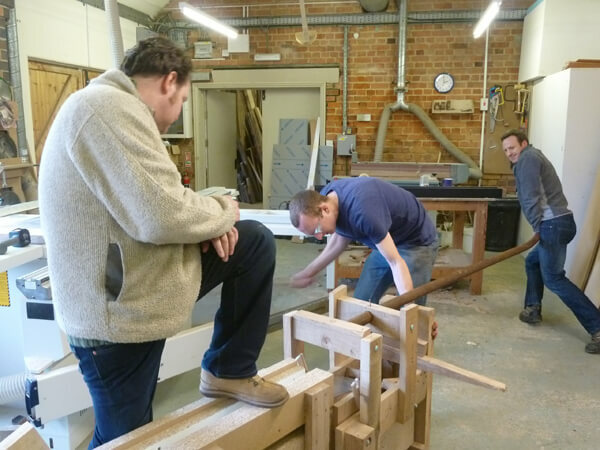 The two things going on in the workshop right now; well we are making a dressing table, a speculative piece aimed very much at trying to get magazine coverage. It’s a ‘pretty’ piece looking to wow a female audience who read those magazines and to a large degree write and edit them. It’s an idea that came out of a discussion with our PR team, in effect they are being our client on this. A very different way of approaching a project! It is also the female counterpart to the desk we made last year. It shares some of its look with that piece, but that was very male, square and dark – in English walnut. 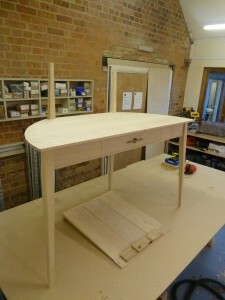 The dressing table is softer, more curvy and in a light bleached ash. I’m still playing around with mirror shape right now. It is a really exciting shape though, looking forward to getting it finished. 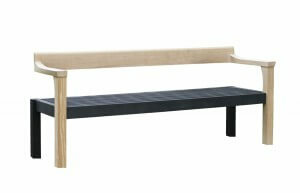 Our other thing running through at the moment are the first of the ‘Floating Benches’ bound for Liberty’s in London. We are making a small batch to see how they go in store (from March onwards). This is our first serious adventure into retail, it’s all new and exciting at this stage. We won’t make our fortune, the margins are tight, but it is a great opportunity nevertheless. So we have been getting the steamer up and running again, as well as gas touch to do oak scorching (both very good things to be doing on a cold January day). We have got these processes down to a fine art now following the Tudor Arcade project where this design theme originated. Click here to watch the Scorch and Steam Video to see how we made Tudor Arcade, we use exactly the same techniques on the ‘Floating Bench’. It is funny looking at that video now, we make it look like really hard work bending the 2 inch oak back rail – turns out the steam pipe was partly blocked so it was much harder than normal. Typical it happens on the day with the film crew in! This time it all went much more smoothly with a lot less grunting and sweating. It’s a really elegant process (when it goes right) and you’d be surprised just how easy it is to bend a piece of oak 6 inches wide and 2 inches thick. We have also been playing with our routed logo again. Our counterparts Cameron and Talbot have a small CNC set up ideal for doing intricate work, including lettering which looks really effective in the blackened oak. On Tudor Arcade it was on the outside of the rails, on our garden benches for Liberty it will be also there, but subtley hidden on the inside of the rail. I really like the fact these benches use both modern technology in the form of the CNC’d logo, but also the age old art of steam bending. Apart from that I’m designing dining tables, side tables, cabinets, a quarter round tray and talking to a number of clients about much larger projects for 2013-14. The quiet start to 2013 won’t last long! 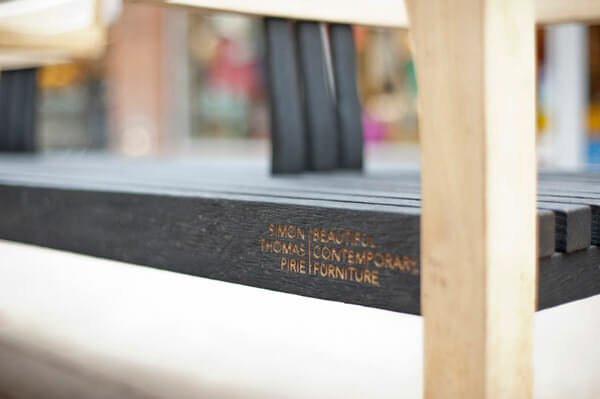 We are in the build up to a couple of shows – Millinery Works ’21st Century Furniture IV’ in Islington is approaching fast in February, then we have open workshops during Purbeck Art Weeks in May and the Dorset Art Fair in June. More details on all these events can be found by clicking here. Our other news is that sadly our apprentice, Connor Clark-Short is no longer with us. Connor started with us back in August but has had to relocate further West for personal reasons. We wish him the very best. We will be looking for a new apprentice cabinet maker again soon.